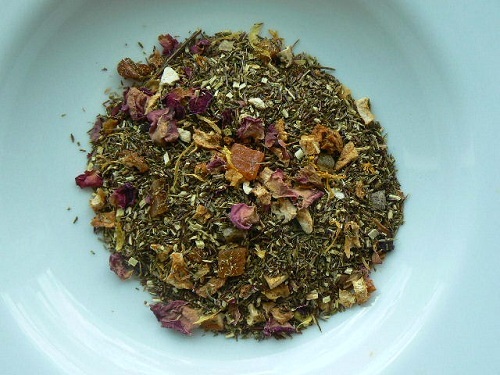 A favorite of tourists to the tropics, our own tribute to Caribbean beauty is displayed in this green rooibos tea . The profusion of bright colors emerges with the addition of papaya, peach and mango bits, orange citrus peel, tropical flower petals and flavor. Hot or cooled over ice, this is our most popular tea with our regular customers. The base green rooibos is certified organic, so it’s lighter and less processed than the red rooibos.